Warning: The following post is replete with spoilers for The Force Awakens. One of the chief complaints which initially arose following the premiere of The Force Awakens was a distinct lack of answers. What was the First Order? Why did it exist? What’s the Resistance versus the New Republic? If there is one thing which the film tended to avoid, it was exposition. The Force Awakens opted to pursue the story at the expense of filling in the details, and when it did, it did so sparingly. In part, a reason for this is that J.J. Abrams chose to show, rather than tell. The visual storytelling of The Force Awakens has not gained a lot of attention, perhaps because it’s hard to stop and appreciate scenes when not watching with a pause button at hand. Nonetheless, we will share our own thoughts on scenes which leapt from the silver screen into our mind. The film does begin with ‘the’ exposition, the opening crawl which as accompanied every Star Wars trilogy film since 1977. It is the mandatory quick setting building, establishing the stakes and loosely creating the world in which we can understand the events to follow. Similarly, like every Star Wars trilogy film yet far, the picture pans away from the empty star field left behind by the yellow textual crawl into a space based event. In this case, it falls upon a bright moon that glows with a brilliant light when contrasted against the darkness of space. Then, the First Order’s ship rises from the lower left hand corner to pierce this light and eventually obscure much of it in an almost impenetrable shadow. Just like that, the film establishes a dichotomy of light versus dark to represent the two conflicting sides. It’s the First Order which obscures the light with their military might as they send storm troopers down to the surface of Jakku to attack the village and capture the missing piece of information which separates them from finding and killing Luke Skywalker. What follows is an assault and an introduction to Poe Dameron. Given that Dameron was originally intended to be killed off halfway through the film, his visual introduction is not nearly as telling as Rey’s or Finn’s. What we do see is that he given the task of courier, given a piece of the map to take to General Leia, and essentially becoming a vehicle to move the plot along. He will do this on the First Order star destroyer by being the means to transport Finn to Jakku, at which point his story was supposed to end. His capture also illustrates an example of the battle between light and dark. Grounded by damage to his X-wing, Dameron grabs a blaster rifle and attempts to fight back against the First Order storm troopers. This includes taking a shot at the man in black, Kylo Ren. Ren’s introduction, after much of the fighting has occurred, informs his status amongst the combat troops, and his descent from a black vessel, dressed in black, while obviously echoing Darth Vader’s suit, also align him quickly as the antagonist of the film. He has swathed himself in darkness in a conflict between light and dark. His power is then illustrated when he exerts control over light, in the form of a blaster bolt fired at him by Dameron, freezing the brilliant bolt in mid-air. And, of course, there is also his mask. Masks in storytelling always indicate something hidden. Ren’s election to wear the mask can be drawn directly to his hero worship of Darth Vader, but for visual matters, it is intended to tell us that there is something more to this character. As the film proceeds, we learn what that ‘more’ is, such as his original identity as the son of Leia Organa and Han Solo, but also the fact that he struggles with the Light Side of the Force. If you want to tell the audience be on alert for something interesting, put a mask on your primary character. Speaking of masks, their removal can also say a lot, such as the situation with FN-2187 or Finn. In the attack on the village, Finn is paralyzed by the death of a fellow soldier who leaves a bloody handprint across his storm trooper mask and is unable to bring himself to kill the villagers in cold blood. For the viewer’s purposes, Finn is shown the truth that there is blood on the hands of the First Order. He cannot remain within it, but this dilemma leads to the moment in the empty troop transport aboard the star destroyer when he removes his helmet to reveal his humanity for the first time. The helmet is ordered back on, but Finn now stands out among his peers as something other than a faceless and merciless soldier of the First Order. His storm trooper armor will be used again to convey his state of mind. The individual who orders Finn to put his helmet back on is Captain Phasma. Phasma wears a storm trooper’s armor, but instead of the flat white, hers is a shiny reflective chrome. If we place her in a military context, where a soldier is always expected to keep his or her uniform or gear in immaculate order, then we can understand that Phasma is a soldier’s soldier or at least a strict martinet. It’s not just her boots that are polished to a mirror finish, it’s all of her armor. Concerning the other First Order characters, including General Hux, their uniforms are distinctly monochrome colors in the shades of black and grey. They aren’t unique, but a part of something monolithic, and share the same colors with the ships and bases they inhabit, almost as if parts to a larger machine. This dull uniformity conveys a sense of shared dogma toward a single goal. Moving onward with the film, Finn breaks Dameron free of his cell and the pair escape in a First Order TIE fighter. 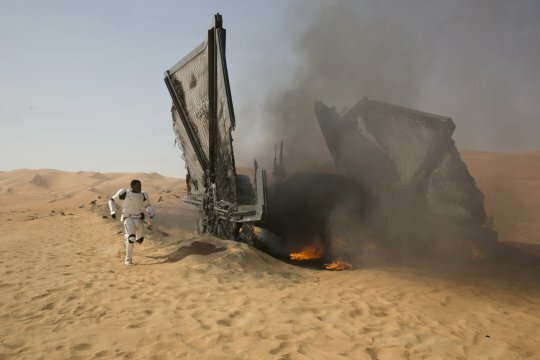 The fighter is damaged and crashes into the sands of Jakku. Finn awakes, alone, with no sign of Dameron. It was at this point in the film that Poe was intended to die, and in a way, his absence can also be connected to the fate of the crashed TIE. Finn barely has time to grab Dameron’s jacket before it sinks beneath the sands and disappears (albeit explosively) for good. It was a vehicle to carry him and Poe to Jakku, but in the same sense, Poe served as a plot vehicle to get Finn to Jakku. His job done, he disappears just like the TIE Fighter. This leaves Finn alone with just Poe’s jacket and his storm trooper armor. That armor is then unceremoniously removed by Finn as he begins his long trudge through the desert. Before our eyes, Finn is stripping away his former identity as a storm trooper and replacing it with a new one. In this case, he puts on Poe’s jacket, which whether he realizes it or not, anoints him as a future rebel, just like its original owner. In time this jacket will move briefly to Rey, who will wear it on the Starkiller Base planet, and not long after donning it there, ends up also a rebel and part of the Resistance. 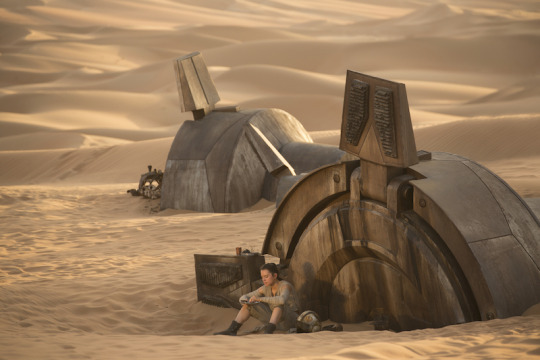 Speaking of our scavenger, the film made a strong effort to reinforce our understanding of her lonely life on Jakku. We meet Rey scavenging parts from an old star destroyer and are provided several shots of her against either the looming relic of a ship or a small orange dot against a vast horizon. She’s rendered as just a tiny part of this landscape and she’s entirely alone. Perhaps tragically, she’s shown to live in a fallen AT-AT, a piece of equipment long abandoned, and as the hash marks inside her home reveal, so has she. The brief shots of the interior of her home reveal a homemade rebel pilot doll, inferring she has been on Jakku from a young age, but also a wilting flower. The wilting flower could be connected also to her own glance at an old, weathered woman, a fellow scavenger, and a foretelling of the fate that awaits her if she never leaves the planet. It also implies that for all the dreariness, she does strive to find beauty in it. She’s an optimist. It’s notable that after she rescues BB-8, there are almost no other shots of Rey which diminish her size relative to her surroundings. The sole exception is when she’s escaped on Starkiller Base and is busy hiding inside the manmade wall of a vast chasm. In that scene, it’s easy to appreciate that she is once again alone, without allies, within the First Order base. On Jakku, however, she encounters Finn and together with BB-8, the pair escape in the Millennium Falcon. The Falcon, in turn, is almost immediately captured by the larger freight/smuggling ship captained by Han Solo. Solo repossess the ship in its entirely, swallowing it into the landing bay of his current vessel. That vessel also represents nothing but hallways but for the bay in which the Falcon sits. It represents Han’s life, a man who has nowhere to go but is left in a perpetual state of travel. The only time he exits a hallway on this ship is to return to the Falcon and escape the two money lending gangs (who in turn, can be said to visually reflect a rock and a hard place.) After a few rathtars and a dangerous jump to hyperspace, the group head for Maz Kanata’s castle slash bar. Before we leave the Falcon, there’s one more scene worth pointing out. When Finn and Rey reveal to Han the precious information being carried by BB-8, we are treated to our first glimpse of the map piece projected into the air between everyone on the Falcon. Framed against celestial bodies, it’s in this position that Han Solo tells Rey and Finn the truth about the Force and about the Jedi. He wears a virtual garland of wisdom and it’s not a coincidence that when he discusses a force which connects all living beings the scenes are shot to show the stars and planets of the map surrounding Finn and Rey. As connected as they are arriving on the planet, they will leave separated. On Maz’s planet, our first visual storytelling piece is her castle. It’s a castle and no one ever thinks “new” when thinking of a castle. Castles in our modern era represent something centuries old and resilient, which is exactly what the character of Maz Kanata is. Maz’s size is definitely relatable to Yoda’s, but her eyes set her apart. Her eyes inform us of the people she’s looking at, be it Finn who doesn’t quite know where he’s headed, which requires her to magnify her eyes to understand him. He’s hard to figure out because he’s indistinct, whereas Rey, she removes her glasses completely. This removal reveals not just that her usual perception of the world around her is magnified, but also she doesn’t need any help seeing who Rey is or what her destiny should be. It’s very clear, even if not to Rey herself. Rey’s own journey to that moment is notable that her path is one which physically takes her into an underworld, as she descends into the dungeons of Maz’s castle, called by the lightsaber which belonged to Anakin and Luke Skywalker. Rey is ultimately captured by Kylo Ren and is bound in an interrogation chair. Here is our other notable unmasking moment in The Force Awakens, when Kylo Ren removes his helmet to reveal a young face. Like Finn, he ceases to be an idea or moving theme of fear and darkness, but becomes human. He becomes more frail without the protection as he exposes his own mind to Rey when trying to force open hers. For as much as Rey is bound in her chair, in this moment, we see her lean forward and out from its confines. For a moment, her body posture reflects her status in the confrontation between Ren and herself. She’s asserting her dominance, albeit briefly. It’s enough to drive Kylo away and eventually, allow her the freedom to affect her own escape. Back on Maz’s planet, a battle unfolds with the Resistance taking possession of the contested ruins which were Maz’s castle. One of the most anticipated moments of the film follows with Han Solo and Leia Organa meeting again for the first time. The film establishes the distance which has grown between them by framing shots of the two facing each other, standing separate on opposite sides of the screen. As the movie continues, that space diminishes right up to the last moment the two share together, which involves an embrace. On a comical note, C-3PO’s intrusive personality is aptly displayed by his lack of situational awareness when he pops up blocking Han’s line of sight of Leia. We haven’t talked yet about Supreme Commander Snoke, whom both Kylo Ren and General Hux speak with on multiple occasions. Snoke’s supremacy over the general of the First Order forces and Kylo Ren is made obvious by his towering hologram. It’s an illusion borrowed from The Empire Strike’s Back, in which the Emperor, in his first reveal is similarly a giant hologram looming over a kneeling Darth Vader. Adding to Snoke’s appearance of supremacy is his placement in what looks to be a throne-like chair, providing a sense of regal command. His actual physical appearance is of someone extremely old, his skin almost translucent, and of course, scarred. When a character is purposefully provided a scar, it’s like Chekov’s Gun, we will find out at some point how or why they were scarred. It’s certainly possible that information will come in a form outside of this trilogy of Star Wars films, but undoubtedly, they will be formative in nature. They represent that Snoke has endured or survived something that helped to lead him to his station. In one such encounter with Hux and Snoke, Snoke grants the general permission to use the Starkiller base weapon to destroy the Republic. This leads to a scene that reflects Triumph of the Will, the German propaganda film which covered the Nazi gathering at Nuremberg. Images influenced by the film have shown up repeatedly in our media, even in such places as The Two Towers with the orcs facing Saruman gazing down at them from his tower of Isengard. We instinctively draw the connection to the Nazis and to evil. We already know the First Order as the newest iteration of the Galactic Empire from the Original Trilogy, so this scene generally presents the climatic height of its evil in The Force Awakens, especially as it precedes the destruction of a number of planets. After all, the Galactic Empire created evil in imitation of nature (the Death Star), but it’s the First Order which has taken an entire planet and corrupted it into a weapon of vast and terrible destruction. It not only destroys planets, but it also requires the death of entire stars to do so. The firing of the Starkiller weapon scenes accomplishes a number of tasks. First, in a moment which is clearly shown to be General Hux’s and the First Order’s greatest triumph, and the entire First Order (or at least those on the base) are present to hear his words and watch planet side, Kylo Ren is absent. Our Dark Side user is on the bridge of the First Order’s star destroyer and watches the laser from afar. It establishes that Kylo Ren isn’t necessarily a part of the First Order or at least, all of its objectives. Second, in a moment which requires the suspension of physics, we are shown multiple planets being destroyed one after another, an effect that is even visible from Maz Kanata’s castle. This hammers in the tragedy and horror of what Hux’s super weapon has accomplished, the total destruction of multiple planets at once. We could have had one cut scene after another of planets being destroyed, but by drawing them together into one shot, The Force Awakens compounds the impact of their loss. Jumping ahead to Starkiller base, Han, Chewbacca, and Finn arrive to accomplish diverging goals: bring down the shield surrounding the planet and to rescue Rey from Kylo Ren’s clutches. Not long after, they find that Rey has rescued herself through a burgeoning ability with the Force and also that despite bringing down the shield, the Resistance will need more help to stop the First Order’s super weapon. This divides our heroes and then divides them again, as Han and Chewbacca split apart to plant bombs through the superstructure. This leads us to the emotional finale of the film, the confrontation between Han Solo and his son, Kylo Ren. Han spots Kylo in the middle of a bridge spanning a vast chasm, which truly reflects the space between father and child. Ren is reachable only by a perilous walkway and Han must bridge that distance if he wants to have any hope at all of rescuing Ren. The walkway has no railings, unlike every other walkway around this chasm, and while this will allow for a dramatic fall in short order, it also heightens the danger of Han approaching Kylo. Leia had sent Han to rescue their son because he had one hopeful fact in his pocket, he’s Ren’s father. For all that Kylo Ren has done, the chance that Han will be successful is low, but nonetheless, the old smuggler steps out onto the thin walkway. Earlier in the battle over Starkiller base, Poe Dameron tells his X-wing pilots that while there is light, hope remains they can stop the super weapon from firing. This is a nod to the waning light of the sun, which is being devoured by the planet to charge its laser. The importance of light remaining comes into play in the Solo family meeting, as Rey and Finn arrive at a doorway high above the walkway. The doorway opens to the outside and a beam of light pierces the darkness of the base’s interior. Our heroes all are generally within the cover of the light, but imagining it as a triangle, Kylo Ren stands at its narrowest angle. 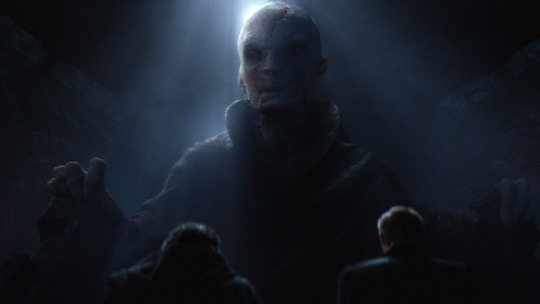 The use of light in darkness also happens earlier when Ren speaks with Snoke, who’s image actually blocks light from reaching his protege standing before. Snoke is casting Kylo Ren into darkness. Back during this major confrontation, by tracking the dying sunlight’s touch upon Ren and Solo, we can watch as Han’s hope to save his son fail with Kylo ultimately making the decision to kill his father when the light ceases to grace his maskless face. Solo’s death is somewhat abrupt and he falls off the walkway and disappears into the chasm below full of diffused light. It’s an interesting decision to make him disappear into light versus darkness, and might imply that our Force convert became one with the Light. That’s not to say we should be expecting a Han Solo Force ghost any time soon, but that he has definitely moved on to the afterlife. Chewbacca, in pain and anger, fires a shot at Kylo with his bowcaster and scores a hit in Ren’s side. This is the accumulation of an entire movie setting up a reasonable explanation as to why Finn and Rey will perform as well as they do against Kylo in the upcoming lightsaber fights. Repeatedly, the bowcaster’s power is demonstrated time and time again, up to the assault on the Starkiller base. It flips storm troopers over and impresses Han enough that he borrows it in the midst of battle. Chewie’s targeting of Kylo Ren establishes one, how formidable Ren really is, to take a shot from the bowcaster and not go down, but also, more importantly, how injured he must be when fighting our heroes. Beyond the visual imagery, The Force Awakens is replete with a number of setups early on to explain things that happen later. The duels which conclude the action in the film (minus one X-Wing’s trench run and ode to both Death Star destruction scenes), very much speak for themselves. The cool blue of Luke Skywalker’s lightsaber against the jagged red of Kylo Ren’s, which since the beginning of the film has indicated its owner’s own inability to control his anger and emotions. Finn fights and falls first, his lightsaber falling into the snow. This becomes our ‘sword in the stone’ moment, except on this occasion, the role of King Arthur is played by Rey. Kylo Ren attempts to pull the lightsaber to him, and as we have seen him pull fully grown men to his side with ease earlier, the fact that he cannot pick up a small lightsaber hilt is striking. When the lightsaber finally pulls free of the snow and into the waiting hands of a Force user, it’s into Rey’s hands it lands. Earlier in Maz’s castle, the lightsaber had called to Rey and she ran away from the opportunity to become its wielder. Now, she accepts this call and her metaphorical drawing from the stone anoints her as the rightful owner. In the climax of the duel between Ren and Rey, he presses her back against another chasm in the ground. The planet from which the Starkiller base was built is now tearing itself apart and opening crevasses across its surface. In that moment of time, Ren offers to teach Rey the ways of the Force and the light cast upon Rey’s face isn’t just the blue of her lightsaber, but the purple of the two lightsabers hues colliding. In a way, she’s in a middle ground, caught between a world of the Light Side and that of the Dark Side. It’s a moment of temptation, which she ultimately rejects and in the process, defeats Kylo Ren. Her rejection of his attempt to lure her to the Dark Side is made visibly obvious as the ground between them breaks away and the two are separated by a crevasse. For the time being, they are divided with nothing to connect them. All that is left now for Rey is to learn the ways of the Jedi. For that purpose, and armed with a now complete map of Luke Skywalker’s travels, she, Chewbacca and R2-D2 depart in the Millennium Falcon to find the lost Jedi Master. Their departure is accompanied by virtually everyone on the Resistance base seeing them off, it’s a priority important to all. The hyperspace trip brings them to a planet of oceans and islands, which in an odd way is similar to life in a desert where oases exist as islands of life in seas of sand. To find Luke, Rey is required to climb countless steps, in effect, ascending upward to find salvation for the galaxy and knowledge of the universal truths of the Force. One can see echoes of monastic Asian temples set upon mountain cliffs and peaks, requiring those who desire knowledge to climb step after step to acquire said knowledge. At the end of the steps, she finds Luke Skywalker and earnestly offers him his lightsaber. It’s an offer which can be interpreted in two ways. In one perspective, she is offering a weapon back to a warrior who had forsaken it and the war it was used in. It’s a call to arms to Skywalker. In another perspective, however, we know that Rey has come to terms with her destiny as a Force user and the gaze she gives Skywalker is a plea for knowledge on how to become what the lightsaber symbolizes, a Jedi. The answer to what the offer means will have to wait until December, 2017, unfortunately. The Force Awakens is an incredible film when one begins to scratch its surface. It is a film which uses the visual imagery of the movie screen to convey unspoken knowledge to the viewer, rather than to simply rely upon spoken exposition to unload all the information surrounding our characters and the events of the film. The reliance on allowing viewers to natively grasp the visual in turn allows for a stronger focus on what is said by the characters. Words become more important and rarely can it be said throughout the film that something is spoken needlessly. One rare instance is the Resistance briefing on the Starkiller base and the result is a somewhat flat moment in an otherwise lively film. The Force Awakens benefited from approximately two years of development and the time and energy from the effort is readily apparent. It is the product of individuals who considered virtually every perspective on the screen and every line in the script. As a result, it’s not a surprise in the least that it speaks so eloquently at times without a word of dialogue.